Batman was my world when i was little (well, him, dinosaurs and Romans), the spin-off from the Adam West TV show was the first film i ever saw at the cinema, my collecting of the bubblegum cards was borderline obssesive and, according to my big sisters, i could read before i started school, mainly from reading the imported Batman titles. I loved them - reading and re-reading them endlessly and cutting out the characters from the lovely glossy cover paper to use as puppets (ouch). I loved them all dearly, but its issue 186 that's left the biggest mark. This image i was fascinated by, mainly the lil' guy and his pointy nose, i used to study it and study it and study it. Of course, my original copy has long gone and i got my replacement i guess about 20 years agao. Just as well, 60's editions have really rocketed in price these last few years. Just looking at this JPEG now, it still dredges up those feelings that i can't quite explain - a mixture of nostalgia and something a bit unsettling. 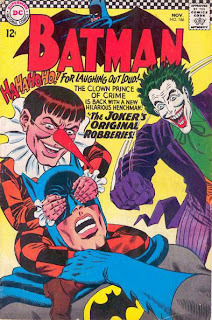 Read the story and its complete tosh - the Joker decides if Batman can have a junior partner, why not him? But, that cover. I love it dearly. 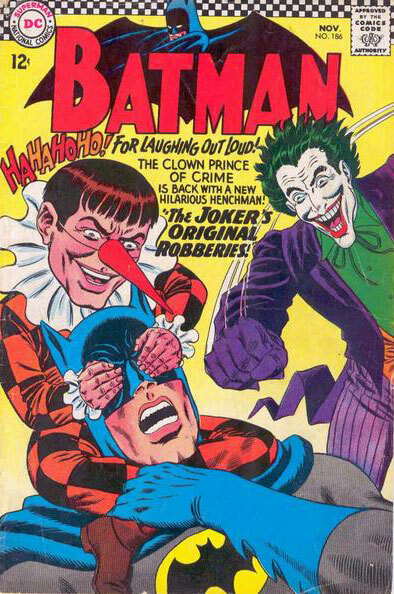 And i got to thinking, last year when i was asking artists if they could depict certain favourite comic characters of mine from my childhood, that it might be an idea to ask for recreations of this cover - send the image to the artist and ask them for their take on it. I'm hoping to collect quite a few of these and it'll be interesting to see folks' takes on it. First to deliver the goods has been Dave Taylor. Dave has been a top bloke to me, what with producing a piece for my old characters project and a lovely robot design for an ad i was producing. I follow his Blog anyway but, since he started on his Batman, Death By Design project, i pop in to see what he's up to even more. It was seeing the fantastic teasers he was putting up, along with his clear love of the character, that made me ask if he'd be up for it. He sure was, although i'd have to wait till his decks were cleared. Well, they've been cleared and here's what he's come up with! 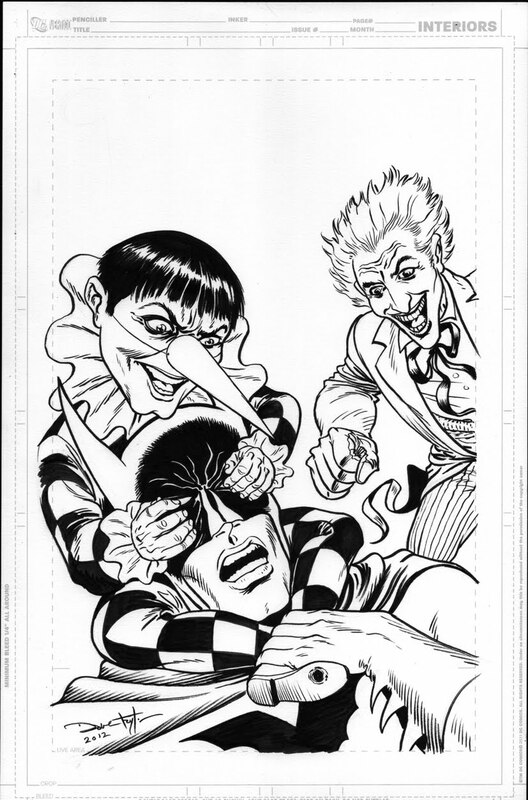 Dave done an interesting thing with Bats, a sort of halfway point between the Infantino 60's original and his Death By Design version. His Joker also seems to a hybrid between the original and his take on the fella seen in that Arkham special a while back. He's really gone to town on the lil' guy though, which is great as he was the focal character for me as a nipper. But this one is far more menacing and downright strange than the original. Love it!